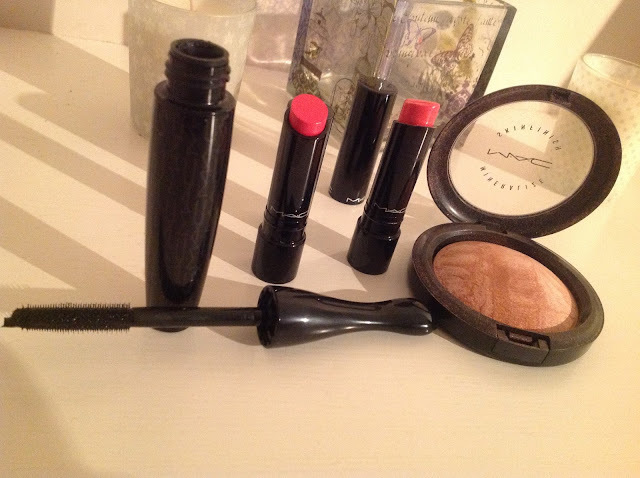 I would like to share with you my recent MAC Haul, I was meant to be on a no spend after my holiday but having ziltch will power - that lasted all of 5 minutes. The new 'blacker and black' formula, I cannot wait to give this a try. It is packaged in a very sleek tube with the MAC logo delicately embossed on the lower part of the body. The wand is a great length and the head is nice and flexible for easier application. MAC Mineralize Skin Finish £22 This is a gorgeous frosty finished blush - beautiful for highlighting the cheeks and brow bone. There are tiny hints of glitter throughout the product and the marbled effect is stunning. The Mineralize Skin Finish comes in a wide range of shades ranging from the more translucent through to a more bronze tone. These are powder not cream. MAC Sheen Supreme Lipstick £15.50 I am loving the MAC Sheen Supreme lipsticks at the moment they are so creamy and the colours are very rich. I purchased 'Full Speed' at a Duty Free counter earlier in the month and I would describe it as 'baby pink meets disco'! Well, the other evening, a gorgeous little Magpie told me that there were Limited Edition Colours in this range - urge to buy one got the better of me and I went for 'Pleasurefruit', which is a slightly darker, more neon pink than Full Speed, I can't wait to swatch it. I will review these individually in full but thought you may like a little sneak peak. The lipstick colors look gorgeous! Thanks Linda, I am looking forward to test driving them. The skin finish look's amazing! What does it look like on? I'm intrigued! I'm after a new bronzer and really don't know what to go for this time around. if you followed me before can you follow me again or on bloglovin please. since changing my blog name my posts haven't been appearing. Hi Chanelle, I will pop over and check if i'm following via blog lovin. This one is actually more of a blush shade than a bronzer - the photo there doesn't actually do it justice as it was taken via IPAD and the lighting wasn't the best - my normal camera was on charge. the lipstick colors look great! Hi Daphne, I haven't actually tried it yet or any other Mac mascara so looking forward to trying it. Have made a couple of wrong choices lately where mascara is concerned so have high hopes for this. Excited to see the lipstick swatches! Hey lovely, great post and great blog! The skinfinishes are lovely, I have a few in my collection. I'd never seen them before. We don't have a MAC counter here yet, so when I spied the one in Duty Free I was so chuffed. I'm tempted to go and buy some more. Oh I love the Mineralize Skin Finish, it's a staple of my routine! I love the colour of the lipstick!! It's so pretty!! How exciting! I've only ever purchased one thing from MAC, the mineralize skin finish is next on my list I think.